Apple Inc. (AAPL) is currently battling Amazon (AMZN) and Microsoft (MSFT) to safeguard its crown as the most valuable American company. The company's shares have lost more than 20% of their value over the last three months owing to the potentially declining sales of its latest iPhone models. Given the recent decline, the stock could prove to be a good value pick. Warning! GuruFocus has detected 3 Warning Sign with AAPL. Click here to check it out. Apple has never really been transparent about its product margins, but management's recent decision to not provide details regarding product-wise unit sales was perceived by the market as a way to hide the drop in the sales of its latest iPhone models. Another negative signal was management's consideration of promotional discounts during the holiday season in order to boost iPhone sales. The company has reduced its orders of new components from suppliers and also cut down the production plan of the iPhone XR by a significant amount. This, in turn, has had a domino effect, with many of its suppliers cutting their revenue guidance, further damaging Apple's stock price. An example is chip manufacturer Cirrus Logic (CRUS), which generates more than 80% of its revenues from Apple. The company cut its revenue guidance for the upcoming quarter, citing weakness in the smartphone market. Some other key examples include wireless chip manufacturer Qorvo (QRVO) and Lumentum Holdings (LITE), which have a reasonable dependence on Apple. Both companies have slashed their revenue guidance as well. Microsoft's services story - can history repeat itself? Microsoft (MSFT) has seen much success after CEO Satya Nadella implemented the software-as-a-service business model. The stock saw a temporary dip, but managed to crawl right back up. 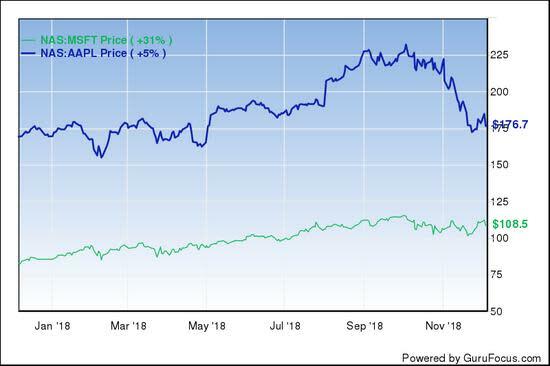 Today, Microsoft is on par with Apple in terms of market capitalization, with the market perceiving the recurring revenues from its products as a major green flag. The chart above depicts the trends in the stock prices of Apple and Microsoft over the past 12 months. We have a clear winner in terms of performance. Apple's recent dip has brought the price down to almost the same level it was a year ago, whereas Microsoft has appreciated by 31%. It must be noted that the true value of Microsoft's SaaS model began to unlock in mid-2016, when the market began to appreciate the value of its recurring revenues. There has been no looking back for the company ever since. The question now is - will Apple's stock follow a similar pattern given the growth rate in its services segment? There is no doubt services revenues have been the best part of Apple's recent results. Despite the fact the growth rate in this segment fell from around 31% to 27%, it is growing at a remarkable pace. While Apple Music is the underperformer in this category, the other units have become major contributors to the total revenue. The company's current quarterly revenue from services is about $10 billion and the annual number could reach as high as a $100 billion in the next fove years if management is able to maintain the current growth rate. It has also become important for the team to work harder on innovation on potentially breakthrough technologies for health, augmented reality and autonomous vehicles. Diversification of products and services and increasing distribution across more geographic areas is becoming more and more essential if Apple wants to stay competitive in the future. The biggest issue for Apple right now is its heavy dependence on the iPhone. It continues to hold a lion's share of the revenues, much larger than the services segment and even the iPad and the Mac combined. A drop in iPhone sales is bound to devalue the stock and there is no certainty as to when this decline is going to stop. HSBC analyst Erwan Rambourg said in a note that the stock is at a stage where it is too late to sell and too early to buy. The company has already lost about 22% of its value in the last three months and there is probably more to come in the December quarter. Given this situation, Apple is an ideal candidate for an investor's watchlist until the iPhone situation stabilizes and service-oriented growth is reflected in the stock price.